The new, noval socket based, Head-Phone Amplifier (HPA) Kit from http://www.tubcad.com, by John Broskie. Just arrived. This will be an interesting Kit to assemble, as the integrated board features (and is configurable into) two distinct modes of operation: Voltage Mode, but what is even more important: the Current Mode of Operation. Yes! 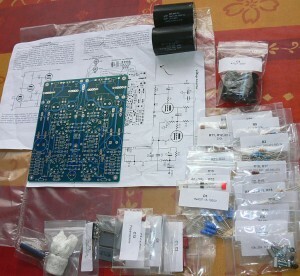 – This is a CURRENT Amplifier, if you wish to configure it so! a). The typical “voltage-output” mode of operation, following the de facto mainstream industry standard, according to which all (~= 99,9999…%) other amplifier topologies adhere to. b). The more interesting and not-so-typical “CURRENT-OUTPUT” mode of operation, representing maybe less than 0,00001% of the topologies that can be found “out there”. Such a current-output topology follows the “infinite output impedance” scenario, whereby the device delivers a fixed current relative to the input signal. In other words, the headphones are driven by current, and not by a voltage on the output of the device. When you think about this concept, it actually makes great sense in the context of headphone amplifiers. Headphones usually consist of a single driver, as opposed to speaker systems, which exhibit multiple driver units, crossover networks. What’s more, the headphone device usually has a fairly flat impedance characteristic across a fairly broad frequency spectrum. Not so in the case of loudspeakers. The impedance curves of loudspeakers run wild across the frequency spectrum, to say the least, often exhibiting a local impedance dip down to say 5 ohms (for a set rated for “8 ohms”), … and then exhibiting a drastic rise of impedance even up to 20 or more ohms as the frequency rises. But to keep it short – it is the current that moves the membranes, and not the voltage. Current drive has therefore much more merit as a modus of operation than that what most of the industry is currently doing. b). allows to blow the output impedance sky high to almost astronomical values (in the case of the “current-output” mode of operation). The design is also equipped with a sneaky Power Supply Rejection Ratio (PSRR) enhancement topology. By fighting “fire” with “fire”, i.e. by purposefully providing the same type of PS noise and injecting it by a specific quantity into a specific location of the circuit, in antiphase, the topology actually renders a largely PS-noise-free signal on it’s output. This increases the listening experience, as headphones are prone to pick up even the slightest amounts of hum, possibly originating from less than perfect power supply circuits. Each channel is comprised of two double triodes. The pre-amplifier stage actually consists of a 12AX7 type of duo-triode, whereby the first, lower triode is used as the input stage, and the second, upper triode is (supposedly) used as a cascode compound amplifier. 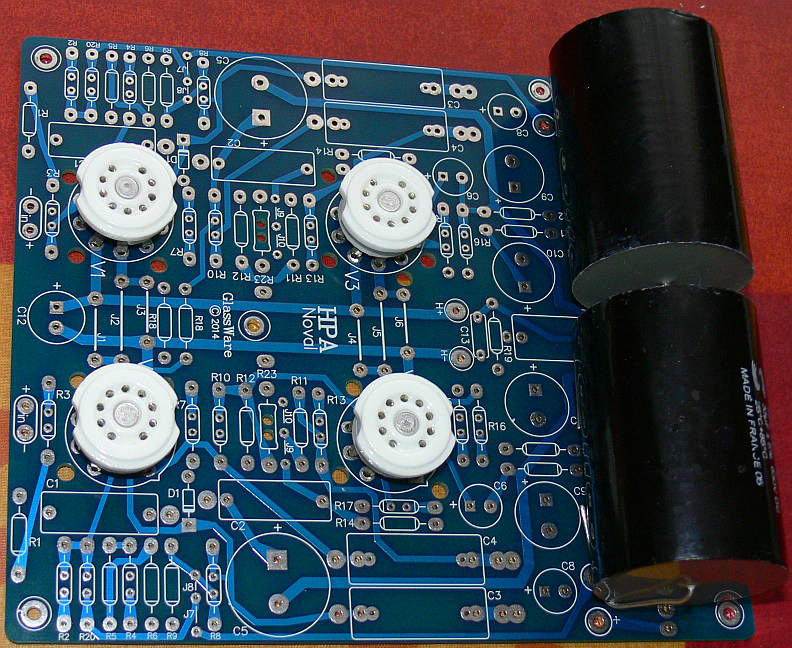 The upper triode sits on top of the lower one and tries to “hold at bay” the anode voltage of the input triode. Strictly speaking, a “pure” cascode would entail that the grid of the upper tube be fixed to a preset constant voltage. Not so here. This cascode is a “semi-” cascode, albeit with a big twist. At least as I understand it. The two triodes work in a very strong positive feedback mode, so that the signal from the lower triode, through its anode, is conveyed to the grid of the upper triode back again to the cathode of the former input triode, theoretically increasing it’s grid-to-cathode difference even more. So how come does this setup not fall into oscillations? From the “looks” of it – why do I get the impression that there is positive feedback involved? Well, here is the sneaky bit. There is a much stronger, global, negative feedback loop, from the output of the circuit, routed to the very same feedback node, to the cathode of the input triode. This setup keeps the contraption stable. But what is the end result of such a topolgy? Well, essentially, as a result, the top triode seems to become the work horse of the input triode, whereby the anode voltage of the lower input triode is indeed kept at a fairly stable value. Any changes are “amplified” and conveyed back to the cathode. Then – the global feedback loop takes care of the rest. So, although (topology-wise) achieved in a totally different manner, in essence the input stage indeed behaves as a cascode compound amplifier. There are many roads to Rome. This is definitely an alternative one, but renders essentially the same results. Well, almost. Did I mention that the upper triode of the pair also performs the function of a phase splitter? A sneaky setup indeed. The top triode, serving both as “cascode” and phase splitter at the same time, strives to shield the grid of the input triodes from the detrimental effects of the Miller Effect capacitance multiplication. Keeping the anode voltage of the input triode at almost a constant value, it essentially eliminates the Miller effect, hence allowing to obtain a high bandwidth spectrum of the input stage, whilst maintaining almost a maximum transconductance of the input tube. The result is a voltage amplifier stage that boasts both high gain, as well as a broad frequency spectrum, with extended bandwidth. The input stage can deliver an amplification factor that is in excess of the amplification factor mu of a single triode. The input stage has a theoretical downside effect of a very miserable PSRR. But this is actually used as an advantage by the output triode pair, which is set up as an Aikido Cathode Follower. Just as fire fighters fight fire with fire, here the Aikido Cathode Follower output stage uses a share of it’s own power supply hum, albeit in antiphase, to fight against the hum trickling into the stage from the input stage. The modified cathode follower strips away the power supply noise that the cascode stage lets through, in a self-nulling act of sorts. The result of all this is a sneaky, and noiseless design, using only two duo-triodes, but in a way that allows to achieve an extensive list of technical objectives and goals. Configurable as a voltage or current amplifier, by a mere change of some few jumpers and passive elements. 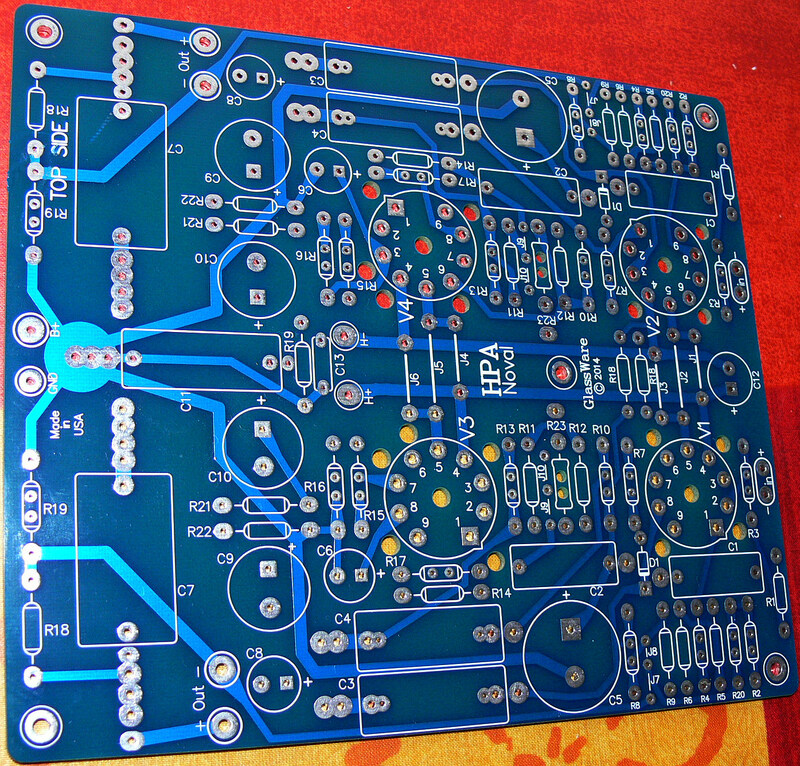 I have made the observation that the PCB board itself has a well designed and mature tracks topology. Especially true in the context of the “STAR-Ground” concept, with is evidently visible within a very logical layout. The board is very thick and immune to flexing or bending. You can easily pull out a tube from the socket, and the board does not flex, while you are at it. A very sturdy execution. The tracks are also very thick. 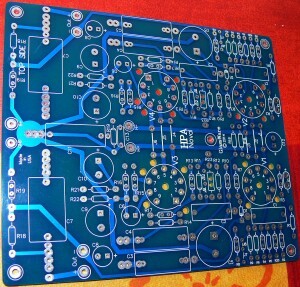 Excellent PCB quality, and attention to routing detail. In the case of the current-output mode of operation, strictly speaking, there is yet another additional feedback loop. Besides the Current-Feedback from the output sense resistor to the cathode of the input tube, there is another feedback path, a voltage feedback path, from the output to the bottom of the phase splitter / cascode tube. All in all, a very smart design. 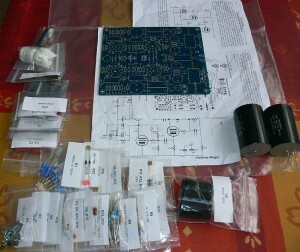 I just can’t wait to get my hands upon my solder iron and put this set together. One caveat though: It is a tough decision: should we go for the Voltage amplifier mode of operation, or the Current Amplifier mode ? The thing is, if configured as a voltage amplifier device, it may then sucessfully provide the output signal to “typical” headphones, which are normally configured as a three-wire setup, being the hot right channel, the hot left channel, and a joint, or common, return lead. The current-output mode of operation entails that the “return” from the left and from the right earlobe of the headphones needs to be a separate lead, since the return of the left and right channel of the current amplifier setup is not at a common ground potential. But then again, the more expensive variety of headphones to not use “three wires”. They normally have two distinct sets of pairs for the left and right earlobe, a typical four wire setup, whereby the “common return” is established right at the headphone plug. In such a case, the challenge reduces to a simple task of ”un-commoning” the left and right common returns within the headphone plug, ie. replacing the three wire plug with two distinct “mono” plugs, providing for a true, four-wire signal path, all the way through. 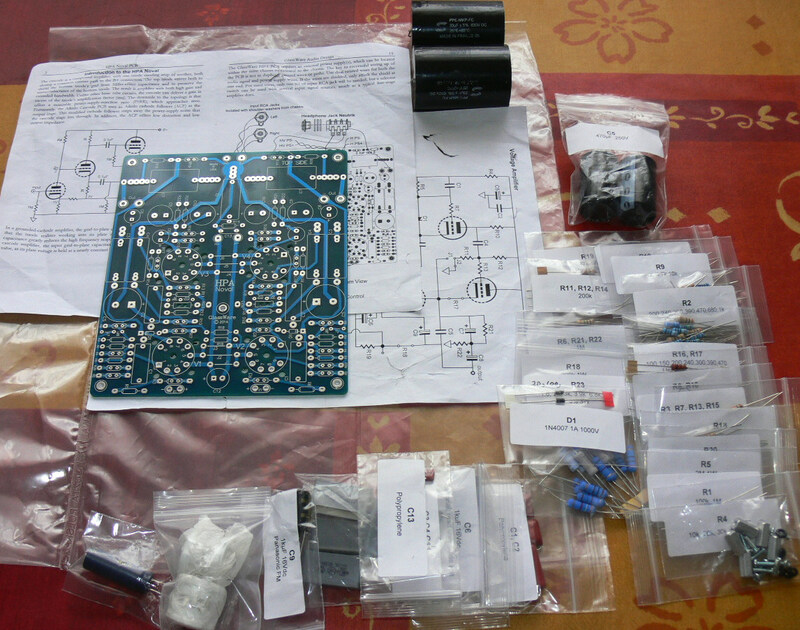 Once you get that piece of “headphone plug” modification done, you are all set for TRUE CURRENT-Output mode of Headphone Amplifier Operation. 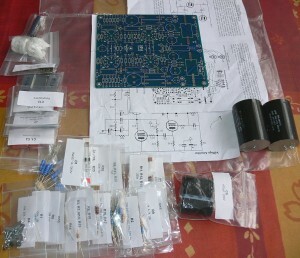 As soon as I have some progress on the assembly of the device, I shall come back to you with some further feedback. As is always the case … “Subject to CHANGE -Without Notice”.